Liczba stron: 352 Jest to ujednolicona liczba stron, która ułatwi Ci porównanie długości książek. Każda strona Legimi to 200 słów. The Powerful Thoughts that Will Lift You Higher The Thoughts You let into Your life can make all the difference in the world. They can drag you down or Lift You Higher and Higher to better places than you could have dreamed of. Many people focus on improving their habits, and this can be useful, but it is very difficult to make a long-lasting positive change when you don’t have the Right Thoughts in mind. With this book You will learn what the Right Thoughts are, and they will help reveal the path to your best life. The 7 Thoughts to Live Your Life By will provide you with the most compelling Thoughts that have the power to help you Make Your Dreams into a Reality, find happiness, achieve success, overcome the obstacles on your path, and become your best self. Internationally bestselling author I. C. Robledo discovered the 7 Thoughts after suffering through a dark depression. While meditating one day, he asked himself how he could live a better life, and the 7 Thoughts came to him in a flash of insight. 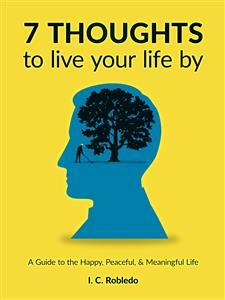 He transformed his life with the 7 Thoughts and would like to help you to do the same. These Thoughts have also been found in religious and philosophical texts from the East to the West, and they have been supported through modern scientific findings. Are You ready to tap into an Eternal Wisdom that transcends any single era, philosophy, religion, or culture? Are You Ready to Awaken? When you learn the 7 Thoughts and master them, you will be ready to Awaken and be able to: Consciously use the 7 Thoughts to create a good, happy, peaceful, and meaningful life Understand that a simple Thought holds immense power, and can have effects on the other side of the world Be a great source of positive energy, and diminish or stop creating experiences of sorrow, anxiety, stress, and pain for yourself and for others Turn a Superpain into a Superpower, meaning to convert painful, difficult, or negative experiences into superpowers, or positive and desirable experiences Accept the Now, love the Now, and understand that the Now is all there is, rather than needing things to be some other way Discover your gift in order to give it away to the world Align your thoughts, words, actions, beliefs, values, and desires to become a unified, happy, and transcendent being Become a limitless being and shine with the stars with the 7 Thoughts to Live Your Life By. Pick up your copy today by scrolling to the top of the page and clicking BUY NOW. Published by I. C. Robledo, 2018. Copyright © 2018 by Issac Robledo. All Rights Reserved. No part of this book may be reproduced in any form without written permission from the author. Brief passages may be quoted for review purposes. The views expressed are those of the author alone and should not be taken as expert instruction or commands. The reader is responsible for his or her own actions. Adherence to all applicable laws and regulations, including international, federal, state, and local governing professional licensing, business practices, advertising, and all other aspects of doing business in the US, Canada, or any other jurisdiction is the sole responsibility of the purchaser or reader. What are the Ultimate Goals of this Book? The goal of 7 Thoughts to Live Your Life By is to transcend the goals of self-improvement books. What does this mean? Whether your goal is happiness, peace, finding your purpose, spiritual healing, productivity, success, wisdom, sociability, clear thinking, or something else that involves improving yourself, I believe you will find what you need here. Ultimately, this book will provide you with a unifying framework to help you maximize your potential. Let’s consider what separates this book from the many others which you may have read. You may have heard that in warfare, or in strategy games, that there are tactics and there are strategies. Tactics are generally seen as concrete actions you can take to solve a specific problem. Self-development books generally focus on this. A focus on tactics can be helpful because often, you have a specific problem, and you need it solved. For example, if you want help with making new friends, then you may find a book that deals with this specific issue. In contrast, strategies are built around not solving one particular problem, but in planning and putting yourself in the best position to deal with any problems that may arise. Although this book does include tactics and concrete tips, it includes them in a way that is ultimately strategic, and that will help you put yourself in the best position to deal with the primary obstacles of your life. 7 Thoughts to Live Your Life By may not show you how to solve your immediate problem, but it will be your toolkit for understanding how to make the best use of your mind, and to use it to its full powers to solve your everyday problems. This approach should ultimately be more effective. A further goal of this book will be to help you attain clarity and focus of the mind. We live in a world overloaded with information – which can be found via the internet, books, news, television, radio, gurus, and so forth. With so much information available, and so much new information being made available daily, it can be difficult to create a calm and focused mind. Our minds tend to go in all directions and accomplish little in the end. The fundamental idea of 7 Thoughts to Live Your Life By is that if we could calm the mind and focus on what truly mattered, then we would be much happier, more at peace, and ultimately able to live a life full of meaning. As a final point, I would like to mention that I have occasionally received emails from people who will explain to me what their life problem is. I have noticed that typically their misery comes from not having applied the 7 Thoughts in their lives. In many cases this is simply because they are not aware of their existence. I have observed this quite often, in fact, and I have found it frustrating to know that their issues could be resolved in a straightforward manner if only they had the same insights that I have had – with this book, now of course it is possible for you to gain those insights. Before delving into the Thoughts, allow me to share some of my background with you in the following section. Now, let’s begin with my life, and what drove me to write this book in the first place. I spent, or perhaps wasted, years of my life. I spent that time in a negative haze, with a dark cloud hanging over me. I had problems with being sociable, so I assumed that people didn’t enjoy being with me and that they did not like me. It was a great struggle for me to be around people, because I felt that they were thinking negatively about me. I didn’t sense it at the time, but my issue was more with my internal negativity, rather than any true negativity on their part. Sometimes, people even asked me, “Why are you so negative? What is wrong?” But I never had a good answer. My belief was that reality actually was negative and terrible, and that I simply had to deal with it. I didn’t understand that I was being consumed by my own negativity at the time – and that my way of seeing life didn’t represent reality. However maladaptive my negative way of thinking was, by my early twenties I was getting used to it. I thought that the negativity was a part of who I was – that it was in my personality. My life had evolved into a bad habit of seeing, thinking, and doing in a negative way. Of course, I was not happy about this – but at the same time, I didn’t see any other options. I didn’t know any other way to be. I felt entrapped, but I couldn’t grasp any way out of the reality that I had created for myself. This way of being lasted for many years, and then came the toughest period of my life. I had applied to a graduate school program in industrial-organizational psychology. I had a deep doubt within me, realizing that I would be tested beyond what I could even imagine. A part of me knew that I was not ready for this program, but I applied anyway. On paper, I was an excellent student, but my communication skills were quite poor, and I was worried about this. Nonetheless, I was accepted into the program. In the first week, I realized that this would be the biggest challenge of my life. However, the work itself wasn’t overly difficult, intellectually. Rather, there was so much work that needed to be done, that there appeared to be no end in sight to it. For example, there was a heavy load of course work, multiple research projects, learning to use statistical programs, management of undergraduate researchers, many administrative tasks, and a variety of meetings per week on research topics, all while I was adjusting to living in a new state. My biggest battle at the time, however, was not the work itself, nor in adjusting to the new location. It was in learning to deal with my own overwhelming negativity. The force of it was becoming greater and greater, as it gained in power under the increasing pressures and stresses of my life. Even in the first few weeks of the program, I did not think that I could deal with all of the work. I felt like I was being suffocated under all of it. I had so much to do and learn that it was overwhelming, beyond anything I could have expected. I had begun to lose confidence that I would be able to do all the tasks required of me. Failure was often on my mind – I sensed that it was inevitable. After several months in the program, I felt defeated. I was keeping up with the work demands, but my mind was telling me that I was going to fail, over and over, and I was not happy. Work occupied my mind all day long, and when it was time to sleep, I could not stop thinking about it. Generally, I would only sleep a few hours per night. I was also losing weight, and I was already thin when the program had begun. A big sign that my mind was malfunctioning was that I was forgetting very simple things. I would forget meeting times and sometimes I could not recall what someone had said to me only moments earlier. At my worst, my mind was occupied with incessant negative thoughts about myself – which is clearly counterproductive. I may have been sitting in a meeting, and my mind would wander into negative thoughts. I couldn’t focus on anything else but this negativity. Eventually, I did not want to be in the program any longer. But I continued with it nonetheless. After a few more months it was winter break. I should have been happy, but instead I found myself bedridden. I spent most of the days in bed, not because of a physical ailment – but because of a mental one. The negativity inside of me was on permanent full throttle now. Imagine getting into your car, putting it in neutral, and then putting your foot down on the gas all the way. The engine is revving so hard that it sounds like it could break, but the car isn’t going anywhere. This is what my mind and my life had become. My mind was working in overdrive to the point of self-destruction, but I was not making progress. The fact that I was in bed, unable to do much of anything, only reinforced the negative thoughts I had had – that I was truly not going to be able to continue with the program. If this is what I have stooped to, how will I ever continue with this graduate program? How will I ever finish my degree? If brushing my teeth is difficult, how can I learn advanced statistics and manage undergraduate students, or even show up to meetings or classes? I thought seriously about whether it was even worth it to continue. But I somehow realized that my mind wasn’t working properly, and I didn’t feel qualified to make such a big decision in that state of mind, so I didn’t quit. In reality, the program was becoming less of a concern – my life itself was now my biggest problem. If I continued to deteriorate at this rate, I would have much bigger problems than just finishing a graduate program. After this lowest of lows, spending most of my days in bed, I decided to finally get some help and I went to my doctor. I was given some tests, and he explained that I had major depressive disorder and dysthymia. He prescribed some antidepressants and he told me to start seeing a clinical psychologist to receive some counseling. He said that in my deeply depressed state, it was critical that I take the medication and attend the counseling. Either one alone would not be sufficient. After a few weeks of following the treatment, I was well enough to function again. I could do basic tasks, but it was still a struggle to operate at the higher level that the graduate program required. After a few months, I was doing fine. I was no longer overwhelmed by a self-created negativity, and I was able to do all of my work without much trouble. The true healing would take many years, however. The medication and therapy helped to reset my mind and body, but I was not truly healed. I still needed to learn to control my mind to prevent this from ever happening again. After a couple of years on the treatment plan, with the aid of my doctor and therapist, I stopped taking the medication and I stopped going to counseling. I felt the need to do this so that I could control my own destiny fully. I wanted to be sure that I was the master of my own mind, and that I didn’t need to rely on either medication or counseling. I intuitively knew that I didn’t need it – my biggest problem was a self-created negativity, and therefore I could learn to control it. In the months after stopping treatment I didn’t feel worse, but I still didn’t feel happy, or like I was on a path that I looked forward to pursuing. I wasn’t overwhelmed with negativity, but I didn’t view this alone as a true success. It’s as much of a success as you would say being absent of pain is a success. The achievement of not being profoundly empty or sad just wasn’t enough. There needed to be more to life than just this. I wanted something more. As an important note, if you want to stop taking a medication or stop a counseling program, be sure to discuss this with your medical and counseling professionals first. There can be great risks with stopping either one suddenly, depending on your situation. Realizing that my life was not yet on its proper course, I reflected on why some things had gone so wrongly. In fact, I often reflected on this. Clearly, my focus on everything negative had not helped. It seemed as if my natural focus on the negative had spiraled out of control, and I was unable to tame it after it had gained a certain degree of momentum. However, I felt like there was something more that I was missing, so I continued to reflect, day after day. Ultimately, this was not bringing me any new insights, and so I realized that I needed to change my approach. Then I began meditating. I believed that doing this could help me to control my own negativity, which it did. But ultimately, what surprised me was that I sometimes had deep insights into myself or about the world that arose through these meditations. My system was that I would enter a peaceful meditative state, and in a deep focused state I was often able to perceive lucidly. Then, I would ask myself a question on how to live a better life, and how to overcome my problems. I believe my mind had synthesized all of the mistakes I had made in my life. It had examined the numerous mistakes and missteps that had led me into a life of growing negativity, to the point that this negative force had become greater than the force of my own true self. In meditation, my mind realized that it was itself, my own mind, which had become the enemy. Thus, through an intuitive and synthetic process, I came up with these Thoughts to help prevent the mind from becoming a destructive force, and to allow it to flourish and become a constructive force – a force for good rather than a force for bad. Essentially, in my personal life, I had been focusing on the opposite of these Thoughts, and so intuitively, my mind must have realized that this had been the source of my problems. I needed to have a dynamic shift, a shift of the mind into the opposite of what it had once been. It would be a transformative process. My challenge would be to flip my focus completely – and to turn everything around. I wrote down the Thoughts, and I began using them as a guide post. I started living my life by the 7 Thoughts, and from then on, my life was never the same. True change didn’t happen overnight. It took years, in fact, but every time I repeated these thoughts to myself, as if they were a mantra, I felt at peace sensing that I was moving along the right path. Things would be alright in the end. Why are These Thoughts So Important? I find that when I stray from these Thoughts, and I allow myself to go with the crowds and fall into negative patterns and worry about what is outside of my control and dwell on the past, that things start to fall apart. Depression and anxiety are not far off. Often, I diverge from the Thoughts just a little bit, then a little bit more, and then I find that I am quickly becoming lost at sea – surrounded by a turbulent storm. Luckily, when I have noticed this, I have been able to navigate myself back to safety. This has happened several times, and I am only more convinced that to live a good life, it is critical to follow these Thoughts every day. Following these Thoughts forces me to be fully conscious about my thoughts, so that I can learn to attract the good thoughts and to let the bad ones flow out of me. When I stop giving fuel and energy to those bad thoughts, they tend to go away in time. I am aware that sometimes authors get excited about an idea or a system that they have only used briefly, and they want to write a book about it. I would like to be clear that the background of this book is nothing like that. I originally had these Thoughts 7 years before the publication of this book. In that time, I have reflected on these Thoughts deeply, and incorporated them into my life. At times, I would briefly forget about them, but every time I did I realized that I had made a big mistake, and I would incorporate them into my life once again. Our true task, which this book shall help with, is to turn the destructive mind into a constructive mind. This isn’t to say that your whole mind is destructive, but perhaps parts of it are. Then, wouldn’t it be best to flip those parts of your mind around and make them work for you in a positive way? Before continuing, I need to mention that since coming up with the Thoughts in meditation, I have realized that they are everywhere. They appear in religious texts, philosophical works, fables and parables, psychological studies, and in everyday maxims or sayings that people say. The fact that they appear over and over in a wide range of important texts, and in the words of a wide range of gurus throughout a span of millennia, shows just how important these Thoughts are. As you can see, I did not discover these Thoughts. They were always there, and I simply rediscovered them for myself. They are common and yet hidden away, because most of us don’t follow them since we are bombarded by thousands of thoughts and pieces of information daily. It is time for us to clear the clutter, and to prioritize the Thoughts in our lives. A key aim of the 7 Thoughts to Live Your Life By is to help you to live a good life. Here, I will discuss the top three ingredients that you will need for this: Purpose, Success, and Happiness. What is your purpose? Do you know? What is your WHY? Why do you do anything? Only you can figure this out, but if you have not, I would urge you to view this as the central issue of your life until you do figure it out. Understand that your purpose is not limited to a field of study. For instance, your purpose is not to be a doctor, it is to save lives. Your purpose is not to be an architect, it is to build the most beautiful or the safest building that ever existed. Your purpose is not to be an artist, it is to make the world come to life with beautiful art that makes people wonder about what is possible. The book Mastery by Robert Greene helped me not only to realize my purpose, but to have the courage to pursue it whole-heartedly. Create your own life purpose statement. Think about what you truly want to get out of life, and how you can get to that point. What do you want to provide for others? What is the most personally fulfilling thing you could do? If you feel like you need more experience or knowledge to figure out your purpose, acquire it. For example, you may contact an expert and interview him or ask how you can be of help. An expert is more likely to help you learn if you commit to helping him, rather than if you focus on what he will give to you. Through helping, of course, you will learn greatly. Make your life purpose statement short and direct. I would recommend that it be either one sentence or two short sentences if possible. When you have crafted it, put it in a prominent place where you cannot forget about it. Also, it does not have to be static. In time, you may choose to modify it or even start over from scratch. Ultimately, we all need to define what success means for us. However, I believe most people have a limited view of what success is, and I would urge you to consider my definition below. A foundation of your success will be your energy levels. We tend to take this for granted, but you need to be feeling good and have a strong vitality to be in the best position to succeed. Even for those of us who appear to be in great general health, we should always dedicate some time to keeping ourselves healthy and energetic. As we know, this involves a combination of eating healthy, exercise, sleeping well, and stress management. In general, I would also recommend that you do things that make you feel more energized and avoid those that do not. For instance, if driving aggravates you and drains your energy, it may be better to find someone who can drive you, or to ride a bike. Next, success is about sticking to moral principles, because if you don’t, then any “success” you achieve is tainted by misdeeds you may have committed to meet that achievement. At its core, morality is about treating others as you would like to be treated, and about being truthful with yourself and others. There is not a specific moral code that you must follow, rather, it will be important for you to do what you know to be right on your path to success. Also, success ultimately happens when you are living out your life’s purpose. You may be in a life situation that makes it difficult to live out your purpose – but I believe it will be worth pursuing with all of your heart and might. If you don’t, you will always wonder what could have been. You must understand that true success comes when you find a way to live your purpose, even if that purpose is not defined by your job. The two do not always overlap. A key way to live out your purpose is to make the most of any special skills you may have, or your gift (See 7th Thought). But ultimately, only you can decide your true purpose. To me, happiness is being free to express yourself, it is being as healthy as you can be, alert, energetic, and able to feel at a full range of emotion and not restricted to always being rational or emotional. Happiness is to be in sync with your morals, to be in the pursuit of meeting your purpose, and to be your true self, not a false created self that you feel other people want you to be. Of course, happiness is to have love in your life, which could come from family or a spouse, or with other people that you develop close connections with. To be happy, it is not required that you have a favorable life. It is possible for a dying person to be happy, or even someone who is in prison to be happy. Happiness is doing your best, but ultimately accepting yourself, people, and situations as they are. It means being able to control your mind (See 1st Thought) so that you can be in a positive state (See 2ndThought), regardless of the situation or environment. The ancient Greeks believed that happiness was something that could not be fully judged about a person until their death. Someone may be happy in one moment or another, but to know if they were truly happy, we must look at their full life. I present the quote above as a reminder. Many of us have thoughts that are completely incongruent with the person that we truly want to be. But rather than change those original thoughts, we learn to justify our actions. Instead, we should go back to square one and examine the thoughts that we choose to have, because from there, they have great influence over what we say and do. Many of us think of thoughts as just thoughts. They are harmless, perhaps even meaningless, you may think. I will show you that this is far from being true. In reality, the sum of your thoughts leads to the sum of your actions, which leads to the sum of who you are. Many people understand that they are the sum of their choices and of their actions. What they don’t always fully understand is that they are also the sum of their thoughts. Their thoughts lead to their actions. Your thoughts will become manifest in your expressions (e.g., such as facial expressions) – and your expressions are contagious. If you have a sad expression, it is much more likely you will make others feel this too. If you smile happily, you may have this effect on those around you as well. Your thoughts will become what you say – and what you say is mimicked by others. Just as your expressions are contagious, so is what you say. Have you ever noticed that you may hear a new phrase, and soon after this you start to hear it all of the time? A catchy expression is mimicked by many and it quickly becomes the go-to catch phrase of the public. Your thoughts will become your actions – which model behaviors for others. Actions are also contagious. If you spend a great deal of time with someone, you may find that you start to do some of the same things. Even if this person has strange or unique habits, you may find yourself mimicking this person, perhaps unconsciously. Your actions will become reactions in others – and those reactions will mimic the original action. For instance, aggression tends to create the reaction of aggression. Love tends to create the reaction of love. Fear in one person tends to spread that fear to those who are nearby. It does not always work this way, but if you perform an action, you are much more likely to create that same reaction in someone else. In summary, your thoughts will become contagious in others – in the form of expressions, words, actions, and reactions that will pass on as if an echo. When you speak in a small room, you will hear your own echo. Similarly, everything you think, say, and do forms a sort of echo reaction in the world around you. You will not be able to perceive that echo, because unlike an echo of sound that reflects back at you almost immediately, the echo of your thoughts and actions passes through the world slowly, but it ripples through the universe for eternity. In fact, much of what we are doing today is the result of the echoes of prior generations – what they thought, what they said, and what they did. Have you ever noticed that there is truth to the saying that we become our parents? Of course, we get to choose our own actions and we are not limited to being who our parents are, but in times of stress or when we are tired or don’t have time to think, our default actions are likely to fall back to what we have seen our parents do. You may find yourself repeating phrases that your parents would say, in the same situations that they would have said them. This is an example of the echoes through time, of people’s thoughts, words, and actions. Perhaps your children will feel the same, and use the same phrases at those same moments, and perhaps their children too. Our thoughts, words and actions transcend ourselves, spreading as if a virus – this can be a good thing if they are positive and bad if they are negative. Understand that what you think ends up creating the entire world around you. Of course, this effect is hard to see because of the slow echoing, but also because we are all playing a role in the thoughts, words, and actions that get passed on, and which ultimately become contagious. Since we are one person of many billions in this world, we feel like what we think, say, and do does not matter. But it does. Your thoughts can propel you forward or drag you down, and they can do the same for countless other people – having a big impact on the people who you surround yourself with. The implications here can run deep. The world becomes influenced by what you think, and it reacts to you based on what you think of the world. What you think is reflected back onto you. If you are in love with the world, you receive a loving energy back. If you are angry at the world, you receive an angry energy back. Thus, you must mind your thoughts. Be careful what you think, because what you focus on and what you think will take up a bigger space in your life. Remember this: Mind your mind. Mind your thinking. What we think has a way of manifesting itself into reality. While I came upon these thoughts during a meditative session, I have thought about them deeply and I would like to explain the logic of these Thoughts, and why they are ordered in this way. By focusing on what you can control, you immediately prevent yourself from wasting your time, life, and energy on matters that are out of your influence and control. With this focus, you will realize that the #1 thing that you can control is your mind, and your mind performs much better when you focus on the positive instead of on the negative. However, if there is a problem in front of you, perhaps one that you have negative feelings about, then you must focus on what you can do to resolve this problem. Your focus will be on what is within your power. Just remember that what you can do is limited by what you have, or your resources. Thus, you must focus on what you have, because this is all that you can work with to resolve your problems. Logically, if you focus on what you have, then you need to focus on the present moment in your life, because this is all that you truly have. The past is done, and the future is uncertain. The present is where you influence the world around you and where you have control. In the present moment, you must keep perspective and prioritize what truly matters in your life – thus, focus on what you need above what you want. What you do not need, you may give away, to give back to the world which has given much to you. I always find it helpful to keep some inspirational figures in mind, to remember that we are capable of much more than we think we are. Here are just a few brief stories of people who have triumphed even when the odds were against them. I hope they inspire you as much as they have inspired me. Cruz was a young man with a 7th grade education growing up in Mexico – making him the most educated person from his village at the time, in the early 1960s. His dream was to go to the US to pursue greater opportunities. In the small village where he was raised, education beyond around the 3rd grade level was considered a luxury that generally could not be afforded. However, Cruz showed a promising aptitude in school, and his father supported him financially so that he could reach the 7th grade. Unfortunately, the pressures on his father with raising a large family made it infeasible for him to continue funding Cruz’s education beyond this point. At 17 years old, Cruz decided to go to the US to pursue greater opportunities. He learned English and went to night school, and then he applied to Purdue University. They offered him admission, and he was immensely grateful for this opportunity. Being a student there was the greatest challenge of his life, as he realized that his educational background left him far behind the other students. By this point he was working full time, taking a full load of courses, and he had a family to support as well. Ultimately, despite the high level of challenge, he did graduate with his B. S. in agriculture. After working in his industry for a decade in the US, he started his own business in Mexico, where he provided and continues to provide research services for leading universities, companies, and institutions around the world. This man is my father, as you may have noticed that we have the same last name. In all of these stories, we have individuals who were far, far behind everyone else. They had fewer opportunities, not more, and yet they managed to lead successful and fulfilling lives. Ultimately, they surpassed the majority of people who would have had many more advantages. I find it important to always keep these types of stories in mind. Whenever you doubt yourself and your situation, understand that many people have thrived even when having come from practically nothing. Now that you know what is possible when you put your mind to it, I believe that you are in the right frame of mind to begin learning about the 7 Thoughts to Live Your Life By. Although learning tools may appear to be a completely different topic than the one this book covers, I believe strongly that we should always be learning something so that we can meet our full potential as human beings. Remember that you are always able to learn about any topic that is important to you. I recommend that you focus on areas you are curious about, or that can help you to get one step closer to your dream job or dream life. This guide stems from my own experiences of using a variety of learning sites and resources. In it, you will discover the best places to go for learning at no cost. Also, I’ll explain which resources are best for you, depending on your learning goals. Now, let’s get back on topic.